The year began with an Ashes drubbing for England, featured a fairytale summer farewell and ended with Virat Kohli arguing with someone. Sport hands out the prizes after a tumultuous year in the cricket world. If his returns in Test cricket were impressive – 1,322 at an average of 55 – his one-day international haul of 1,202 at 134 bordered on ludicrous. Despite defeat in England, Kohli led India to a first Test win in Australia in 10 years – and they will begin 2019 as they did 2018, as officially the best side in the world. If New Zealand had played more than six Tests, Kane Williamson – with an average of 67 – might have run Kohli close, while Alyssa Healy won a staggering four player-of-the-match awards in six games as Australia women romped to the Women’s World Twenty20 title. Walking out to bat, taking guard, maybe even adjusting his box – Cook was given countless standing ovations before he sent the Oval crowd into a frenzy with a fairytale farewell century in his final innings. Cook called Anderson the greatest player of all time. Anderson said the same about Cook. There wasn’t a dry eye in the house. Bancroft was caught during the Cape Town Test against South Africa trying to scuff up the ball using sandpaper – which he then tried to hide down his trousers. All in full view of the television cameras. Bancroft was banned for nine months, while captain Smith and vice-captain Warner – both of whom admitted knowing about the plan – got a year apiece. Coach Darren Lehmann said he didn’t know about the sandpaper plan and wouldn’t resign. Then he did. Needless to say, there were tears there too. 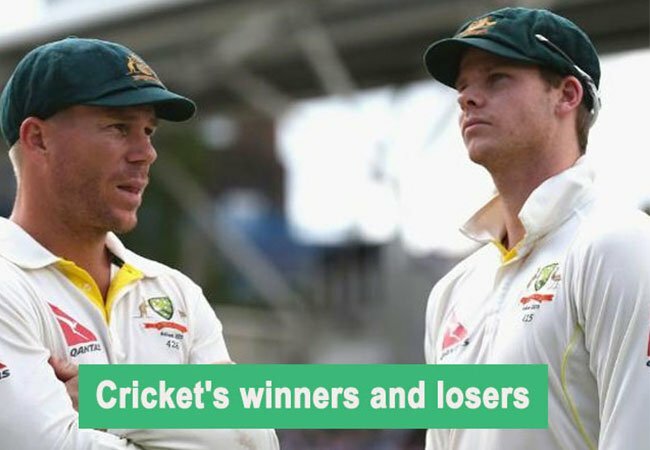 A couple of hefty defeats on that ill-fated tour of South Africa were contenders for this prize – Australia lost the third Test by 322 runs and the fourth by 492 – and they were crushed by 373 runs by Pakistan in Abu Dhabi. It was Australia’s heaviest one-day defeat in terms of runs. They lost the series 5-0. The flight home could not come soon enough. However, at a time when England seem intent on bringing the collapse back into fashion, it simply had to be Joe Root’s side who collected this gong. It began with CCTV footage of Australia’s David Warner and South Africa’s Quinton de Kock being separated by team-mates in the stairwell outside the changing rooms in Durban. Confrontation is like oxygen to the scowling India skipper Virat Kohli, although his ‘mic drop’ impersonation in an attempt to rile Joe Root at Edgbaston proved fruitless. The award, though, goes to England’s Jonny Bairstow, who ‘celebrated’ his century against Sri Lanka on his return to the side by ripping off his helmet, dropping his bat and letting out a roar that would not have been out of place in WWE. Amelia Kerr smashed a women’s record 232 not out off 145 balls for New Zealand in an ODI in Ireland. Then she took 5-17. Best of all, she was only 17 at the time. Australia seamer Andrew Tye, who conceded an eye-watering 0-100 from nine overs in England’s ODI-record 481 at Trent Bridge. Glenn Maxwell‘s remarkable effort to remove Faf du Plessis, leaping to catch the ball at long-on, throwing it up in mid-air while over the boundary, jumping back inside the rope and completing the catch on the run. In an age when exceptional catches have almost become the norm, this was still something else. David Warner, one of cricket’s most notorious sledgers, walked off the field mid-innings during a Sydney grade match after receiving a few choice words from Jason Hughes, the brother of the late Phillip Hughes. While what was said remains a mystery, the irony was not lost on anyone. Can you name the bowler with the best Test figures of 2018? Didn’t think so. It’s time to doff your cap to South Africa left-arm spinner Keshav Maharaj, who took 9-129 against Sri Lanka in July. South Africa still lost by 199 runs. Congratulations to the Joyces. Ed, the former England batsman, called time on a distinguished 21-year career after playing in Ireland’s inaugural Test in May, and his sisters Isobel and Cecelia followed suit when Ireland bowed out of the Women’s World Twenty20 in November. Surrey may not be the most popular team in county cricket, but not even their harshest critics could fail to be impressed by the manner in which they dominated the County Championship this summer. They won a first title for 16 years with two games to spare – and did it thanks to 13 home-grown or academy players. An award you didn’t expect to be reading about, but the England and Wales Cricket Board’s decision to reduce the residency qualification rules for overseas-born players from seven years to three means we could all enjoy the supremely talented Jofra Archer – born and raised in the West Indies, now playing for Sussex – wearing an England shirt in the not-too-distant future.